Pens for Kids accepts all kinds of scholastic materials - new or used - such as ball point pens, pencils, felt pens, gel pens, speed markers, highlighters, crayons, pencil sharpeners, erasors, rulers, geometry sets, pencil cases, water colour sets etc. We also accept unused notebooks and similar, but so far we don't have sufficient means to send heavy equipment such as paper, chairs, tables or blackboards to Africa. We further accept new or used sports equipment such as balls, football clothes, track suits etc. - but again - heavy equipment is too expensive for us to send to Africa, and please consider what kinds of sports equipment are suitable. Kids in Africa have no places to use roller skates, ice skates, curling stones or similar equipment that require paved areas or other special facilities. *) If you use UPS or similar services, the receiver may be met with considerable charges for custom fees, post office fees, storage fees and many other fees / bribes for corrupt officials. Pens for Kids can and will not cover such unreasonable charges and may have to reject the shipment in such cases. Pens for Kids Denmark: www.pensforkids.dk (Danish/English) / www.pensforkids.mono.net (Danish). Pens for Kids Denmark accept donations of scholastic materials and sports equipment. Pens for Kids UK: www.pensforkids.co.uk. Pens for Kids UK accepts donations of scholastic materials. Pens for Kids Canada: www.pensforkids.ca. Pens for Kids Canada accepts donations of scholastic materials. Pens for Kids Australia: Webpage. Pens for Kids Australia accepts donations of scholastic materials. 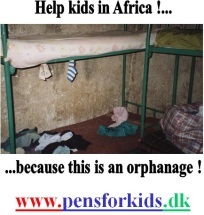 If you send your donation to Pens for Kids Denmark, UK, Australia or Canada, we forward the donated materials to our daughter organisations in Kenya, Tanzania, Uganda or to schools, orphenages and similar charity organisations in development countries - at our cost. However, if the donor lives closer to Africa than we do, we kindly ask that the pens be sent directly to Africa instead, if it makes no difference to the donor. You are welcome to send pens directly to the organisations or to individual "Pens for Kids Ambassadors" - you can find their addresses on the page "PFK Ambassadors"
- Our contacts in Africa distribute the pens to underprivileged children in their local areas at no charge. 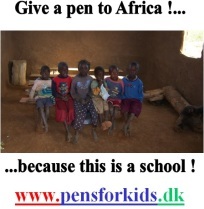 Pens for Kids Denmark occasionally transfer funds to the daughter organisations to cover the distribution costs. This website is edited by Founder & Chairman of Pens for Kids Denmark, Chemical Engineer Claus K. Hjørnet - and sponsored by his company: ScandeNOx Aps. ScandeNOx supplies NOx reduction systems to power plants, cement kilns, refineries, industrial boilers, process and combustion systems.